It's probably because when Excel thinks "comma-separated values", it actually searches for some other delimiter (I think it's semicolon but it's not important). Now when I have already opened this file in Excel, is there a button or something to tell it "reopen this file and use comma as a delimiter"? I know I can import the data into a new worksheet etc. but I'm asking specifically for a help with situation where I already have a CSV file with commas in it and I want to open it in Excel without creating new workbook or transforming the original file. as the first line of your csv file will automatically tell Excel to use that character as the separator instead of the default comma. will result in pipe (|) being used as the delimeter instead the comma, without the user having to run in through the import wizard first. I don't know if you managed to resolve this issue, but I also had the same problem and sorted it out after some investigations. Go into your control panel --> Regional Settings --> Advanced Settings and change your list separator to a comma. Mine was set to semi-colon for South Africa after I changed to Windows 8. After I changed it to a comma, all my CSV's open correctly with Excel 2013. I used the same steps as Lèse majesté, but I also changed the Decimal symbol from a comma (,) to a fullstop (.) and it fixed my problem. This is because, by Default, Windows 8 uses a comma as a Decimal symbol and Excel gets confused when it has to use both the characters as separator and Decimal symbol. This is what worked for me - it is a combination of some of the answers here. An alternative to steps 2+3 would be to change these settings in the system settings (step 1) but I generally want to have numbers formatted according to a Czech locale. Downsides: in Excel, I now need to enter decimal numbers using the US locale, i.e. using the dot instead of a comma. That feels a bit unnatural but is an acceptable trade-off for me. Fortunately, the comma key on my num-pad turned to the dot key automatically (and only in Excel - other apps still output a comma). Apparently Excel uses a Windows 7 regional setting for the default delimiter for CSVs (which is apparently a tab by default). You can change that setting like so. However, I don't know what other repercussions this will have. I suppose if all the CSV files on your computer are comma separated, then there shouldn't be any problems. But if you have another (likely Microsoft) program that also uses CSV files, and it normally uses CSVs formatted with a different delimiter, then this could be problematic. E.g. if, say, Outlook uses tab-separated CSVs for importing/exporting contacts, and you receive such CSVs from an outside source (Gmail, another computer, whatever...), then changing this system-wide setting could prevent Outlook from opening these tab-separated CSVs. LibreOffice Calc has a very advanced csv filter that lets you choose separators, formats and encodings. I work extensively with data in various formats and very often need to send these data in Excel format to users. I use LibreOffice Calc to convert csv-files to the desired format, then save as xls. This may not answer how to do it easily in Excel but it answers how to do it easily, especially as OP in the comments suggests using something other than excel would be an acceptable option. Type "intl.cpl" and hit Enter. Change the Decimal Symbol to a dot. Change the "Digit Grouping Symbol" to a space. Change the "List Separator" to a comma. Changing decimal separator to . (dot) and list separator to , (comma) helped to maintain CSV in normal view in Excel in Norwegian computers. For my system, the settings were already set to what others here have suggested (Decimal symbol set to . (dot) and List Separator set to , (comma) BUT I was still having the display issues importing a CSV file exported from a different application. After a little trial and error, I found a solution that opens every CSV file in the correct view. Control Panel> Clock, Language, and Region> Region> Additional Settings> List separator set to , ; (comma AND semi colon) -> click "apply" and then see if that does the trick. In Excel, DATA tab, in the Get External Data subsection, click "From Text" and import your CSV in the Wizard. I know that an answer has already been accepted, but one item to check is the encoding of the CSV file. I have a Powershell script that generates CSV files. By default, it was encoding them as UCS-2 Little Endian (per Notepad++). It would open the file in a single column in Excel and I'd have to do the Text to Columns conversion to split the columns. Changing the script to encode the same output as "ASCII" (UTF-8 w/o BOM per Notepad++) allowed me to open the CSV directly with the columns split out. You can change the encoding of the CSV in Notepad++ too. 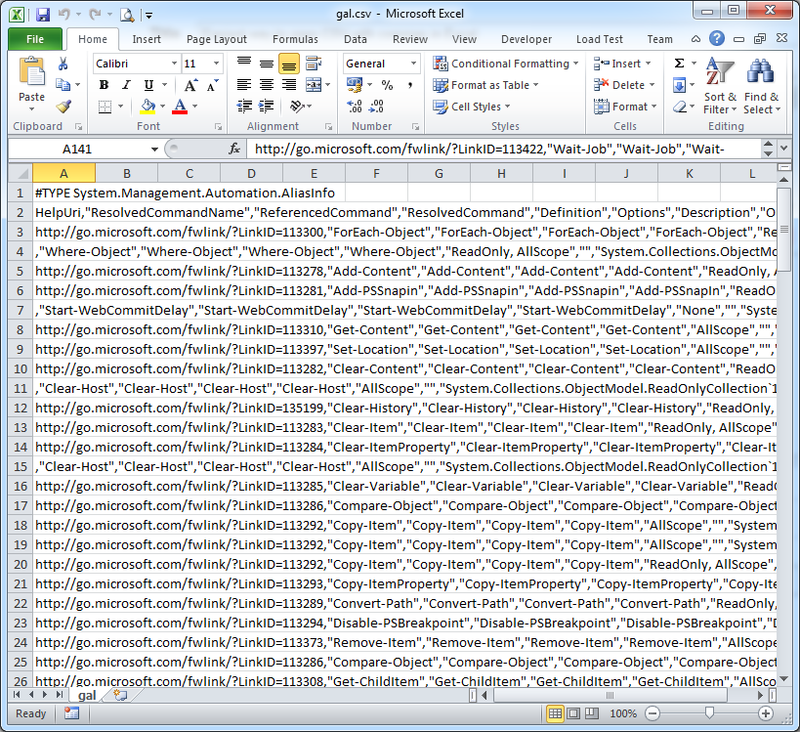 With the newer Excel version 2010 you can open (menu: File, Open, or control-O) a .CSV file as a text file. Then, you directly get the wizard, just as easy as with LibreOffice Calc, where you can select the correct field delimiter. Not the answer you're looking for? Browse other questions tagged microsoft-excel microsoft-excel-2010 csv or ask your own question. Excel save-as CSV options — possible to change comma to pipe or tab instead? What is the “sep=” metadata you can add to CSVs? Advanced 'text to columns' in Excel - is there an add-in/macro available anywhere? Which delimiter allows major spreadsheet programs to open CSV files by double-clicking? 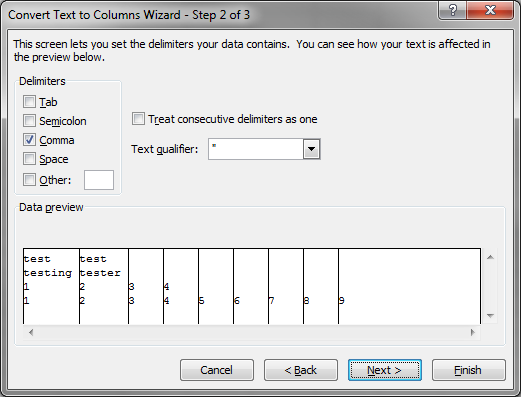 How do you change default delimiter in the Text Import in Excel? How to get Excel to interpret the comma as a default delimiter in CSV files? Create CSV file from Excel with delimiter other than comma? How can I dynamic change separators configuration in Excel 2016 for CSV files?